November 2018- Anthony & Ashley are excited to share with you the all new season of "Life is for Living TV" including their 56th, 57th, 58th, 59th, & 60th webisode! This season includes teachings about The Spirit of God, Obedience, and being in His Presence. Click here to view our Life is for Living TV playlist! January 2017- Ashley & Anthony are featured in the February 6th issue of Soap Opera Digest Magazine on pages 74-77 with an exclusive interview. On stands now! December 2016- The Tesoro Family would like to wish you a Merry Christmas & a Happy New Year! Their son Anthony John Tesoro turns one on Christmas Eve, December 24th. Take a look at their beautiful family video featuring Lil' Anthony's first year of life! Touching video clips & photos. View Now! October 2016- Anthony, Ashley, Gabriella & Baby Anthony are featured in the October 24th issue of Soap Opera Digest Magazine on page 29 in a write-up about their Christening, Anniversary, & Birthday event! Anthony & Ashley Christened their son in an event in Los Angeles on September 4th; at the event Anthony & Ashley celebrated 15 years of marriage, & also celebrated Anthony's birthday as well! 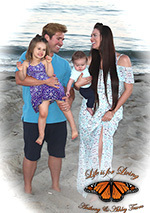 July 2016- Take a look at the all new webisode of "Life is for Living TV" with a teaching from Anthony about "Love," a beautiful segment featuring the Tesoro Family at the beach; and a singing segment with Ashley featuring "Come Just As You Are." View Now! July 2016- Take a look at the all new webisode of "Life is for Living TV" with a teaching from Anthony about "Hope," a beautiful segment featuring Ashley's sea life photography; and a singing segment featuring "Blessed Assurance." View Now! July 2016- Take a look at the all new webisode of "Life is for Living TV" with a teaching from Anthony about "Faith," a beautiful segment featuring Ashley's lyrical dance; and a singing segment featuring "I'd Rather Have Jesus." View Now! June 2016- Take a look at the all new webisode of "Life is for Living TV" with a teaching from Anthony about "The Miracles Of Jesus," a beautiful segment featuring Gabriella's ballet dance; and a singing segment with Ashley featuring her "Amazing Grace" music video.View Now! June 2016- Take a look at the all new webisode of "Life is for Living TV" with a teaching from Anthony about "The Miracle Of Life," a beautiful segment featuring the Tesoros' Mother's Day 2016; and an all new healthy living segment with Ashley and Gabriella! View Now! May 2016- Take a look at the all new webisode of "Life is for Living TV" with a teaching about "God's Miracle Working Power," a beautiful segment featuring the Tesoros' recent family photo shoot; and an all new healthy living segment with Ashley! View Now! March 2016- Anthony and Ashley have released a video of their family during a recent three month photo shoot for their baby Anthony. Adorable footage and family photos! View Now! February 2016- Anthony and Ashley are featured in Soap Opera Digest Magazine about the birth of their son Anthony John! They are in the February 22, 2016 issue on page 12. On stands now! December 2015- Anthony & Ashley are so excited to announce the birth of their son Anthony John Tesoro. He was born on December 24, 2015 at 9:40 P.M., 5 pounds 12.4 Ounces & 19 Inches. Please take a look at his birth announcement and baby photo shoot video! View Now! December 2015- Anthony and Ashley are featured in Soap Opera Digest Magazine with a write-up about their upcoming baby arrival! The article is released on December 25, 2015 on page 26! November 2015- Take a look at the all new webisode of "Life is for Living TV" with a teaching about "Being A Godly Christian," and a beautiful segment featuring the Tesoros' recent family photo shoot! This is part three of a three part series on "Godliness." View Now! October 2015- Take a look at the all new webisode of "Life is for Living TV" with a teaching about "Godly Marriage," and a beautiful segment featuring Anthony and Ashley's September 30, 2001 wedding! September 2015- Take a look at the all new webisode of "Life is for Living TV" with a teaching about "Godly Parenting," and beautiful segments featuring Ashley and Gabriella! August 2015- Anthony and Ashley are featured in Soap Opera Digest Magazine with the news about their second pregnancy! July 2015- Anthony and Ashley are thrilled to announce that they are having baby no.2! Take a look at their announcement video where they reveal the baby's gender! July 2015- Anthony and Ashley are featured on SoapOperaDigest.Com and CBSSoapsInDepth.Com with write-ups about Ashley's pregnancy. July 2015- Anthony and Ashley are excited to share with you their new "Life is for Living TV" webisodes. In webisode 12 Ashley preaches the message and Anthony teaches the "Inspired With" and "Healthy Living" segments. We hope you enjoy! June 2015- Anthony and Ashley are excited to share with you their new "Life is for Living TV" webisodes. May 2015- Anthony and Ashley are excited to share with you their new "Life is for Living TV" webisodes. April 2015- Anthony and Ashley are excited to share with you their new "Life is for Living TV" webisodes. March 2015- Anthony and Ashley are excited to share with you their March and April 2015 webisodes of "Life is for Living TV." February 2015- Anthony and Ashley are excited to share with you their all new 2015 webisodes of "Life is for Living TV" featuring their all new format, new segments, their new LIFL logo; and new segments featuring teachings out of the Word Of God, "Inspired With Ashley" segments, and health segments as well! Anthony and Ashley will be releasing one webisode per month. This year they will be focusing on teaching about the "Ten Commandments" and what that means for you; and how you can apply these principles to your own life. December 2014- Merry Christmas from Anthony, Ashley, & Gabriella! December 2014- Anthony, Ashley, & Gabriella are featured on SoapOperaDigest.com in a write-up about their "Life is for Living TV" web-series! View Now! November 2014- Happy 1st Birthday Gabriella! Gabriella turned one on November 18th! Anthony and Ashley would like to share with you her birthday video with footage and photos from her first year of life. View Now! 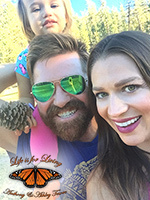 November 2014- Anthony and Ashley are excited to share with you their all new webisode of "Life is for Living TV" featuring an all new format, new segments, a new LIFL logo; and they have incorporated their daughter Gabriella into the series! They hope you enjoy it! Be inspired... Learn about Love, Life, Joy, & Peace. Anthony & Ashley Tesoro will show you how to live life to the full! View Now! October 2014- Anthony's wife Ashley and their daughter Gabriella are featured in Soap Opera Digest Magazine in a photo with music legend Jackson Browne, in the October 6, 2014 issue on page 24! September 2014- Anthony and Ashley celebrated 13 years of marriage on September 30, 2014. They would like to share their anniversary video with you! View Now! April 2014- Anthony, Ashley, & Gabriella are featured on Soaps.com in an exclusive interview! View Now! April 2014- Happy Easter from Anthony, Ashley, & Gabriella! February 2014- Anthony's wife Ashley releases her new country music video for her song "Angel Blue" featuring clips of Anthony, Ashley, and their daughter Gabriella. View Now! January 2014 - Anthony, Ashley, & Gabriella are featured in Soap Opera Digest Magazine with a write- up about Gabriella's birth! They are featured in the January 20, 2014 issue on page 53. In stores now! Pick up your copy today! December 2013- Anthony, Ashley, & Gabriella Tesoro wish you a Merry Christmas & a Happy New Year! November 2013- Anthony and Ashley are proud to announce the birth of their beautiful daughter Gabriella Lyn Tesoro. She was born on November 18, 2013. September 2013- Anthony is featured with Ashley in an exclusive interview in "Soap Opera Digest Magazine." The article features an interview about Ashley's pregnancy, her music, their ministry, and their web-series "Life Is For Living TV." Anthony and Ashley are featured in the September 23, 2013 issue on pages 74-76. In stores now! Pick up your copy today! May 2013- Anthony launches Combat Karate "Fight Club!" View Now! May 2013- Anthony and Ashley are so excited to announce that Ashley is pregnant, and they are having their first child due in November! They have put together a video announcement for you to enjoy. View Now! April 2013- Anthony & Ashley release "Life Is For Living TV" Season 4! "We hope you are enjoying Life Is For Living TV. We created this show to encourage, inspire, and uplift people. To give hope in an uncertain world, and to spread the Gospel of Jesus Christ in a way that all people can receive. Please enjoy our new season!" -Anthony & Ashley View Now! March 2013- Anthony releases his karate action photo shoot & training video! View Now! Also, check out Anthony's new karate photos in the martial arts gallery! January 2013- Anthony launches Combat Karate seminars! View Now! January 2013- Anthony launches new web-series "An Inside Look..." These webisodes are a behind the scenes look at his Karate Combatives teaching & training at Tom Bloom Martial Arts. View Now! December 2012- Anthony & Ashley launch "A Life Is For Living TV Christmas Special." View Now! November 2012- "Life Is For Living TV" Season 3 Episode 6 is available for you to view! This is a special bonus episode with beautiful nature and wildlife scenery. View Now! October 2012- Anthony and Ashley release "Life Is For Living TV" Season 3! View Now! July 2012- Anthony is interviewed about his life and ministry in an exclusive "Life Is For Living TV" episode! View Now! June 2012- Anthony and Ashley release "Life Is For Living TV" Season 2! View Now! June 2012- In addition to his Business Degree, Anthony now has a Criminal Justice Degree from the University of Phoenix! He was also inducted into the National Criminal Justice Honor Society (Alpha Phi Sigma). June 2012- Anthony promoted to blue belt in Brazilian Jiu Jitsu by four time BJJ world champion Fredson Paixao. April 2012- Anthony and Ashley are featured in Soap Opera Digest Magazine in an exclusive write-up about Ashley's music and her latest album "Simply Worship," as well as their "Life Is For Living TV" internet show. The article is in the April 16th 2012 issue located on page 52 in the "Where Are They Now?" section. On news-stands now. Pick up your copy today! April 2012- Anthony & Ashley launch "Life Is For Living TV" through their production company Tesoro Entertainment, LLC in association with Tesoro Ministry Foundation, Inc. LIFL TV is a Christian lifestyle and ministry internet show that Anthony and Ashley host and produce together. Through this show, they teach individuals and families about the Bible with real life application, and give people inspiration and direction for their lives. View Webisodes Now! April 2012- Anthony executive produces his wife Ashley’s latest album "Simply Worship" and her music videos through their record label Tesoro Records/Sacred Music. View Music Videos! December 2011- After three decades of martial arts training and teaching Anthony launches his new self-defense training system; Tesoro Fighting Systems: Combat Karate. It is a Karate based MMA-system for self-defense that is comprised of Karate, Muay Thai, Submission Wrestling, and Self-Defense. November 2011- On November 16th Anthony was promoted to 6th degree black belt Master of Karate by 9th degree black belt Grand Master Tom Bloom. This was in recognition of his three decades of martial arts training and teaching. View photos of Anthony's promotion! September 2011- On September 30th Anthony & Ashley celebrated ten years of marriage. With friends and family present they renewed their vows and held an anniversary party in honor of this occasion. During the Hawaiian themed celebration they shared personal vows with one another; and then exchanged Hawaiian leis to commemorate the event. View photos of the event!